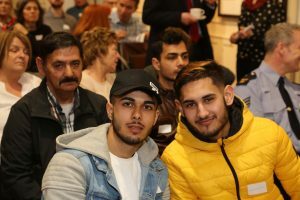 Travellers and Roma gathered at Pavee Point Traveller & Roma centre to celebrate their achievements in education and make suggestions for the future, on International Traveller and Roma Day 8 April. Alex Petrovic says self motivation is essential to get through education. 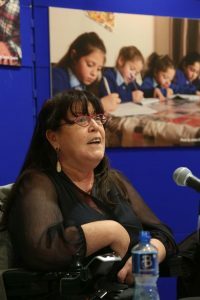 Rosaleen McDonagh, writer and PhD candidate said: “Formal education was not always kind and respectful to me, to my ethnicity. However, learning to read and write has been the one achievement that saved me. Rosaleen McDonagh says the State owes Travellers for the huge deficit in Traveller education. 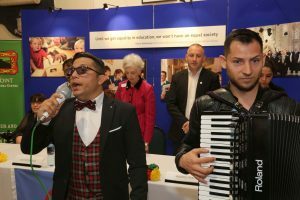 “A push needs to happen so that third level education for Roma children becomes a norm. I am the only Roma in my university, that I know of, but judging by my siblings I won’t be the last,” she said. While Higher Education Authority figures show that while 1/15 adults in the State is studying in one of the universities, institutes or colleges – there are just 61 Travellers in Higher Education. Manix Servan sings Gelem Gelem the Roma anthem. 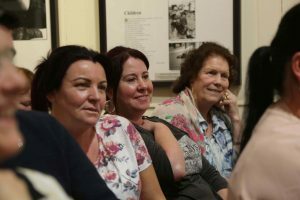 Sindy Joyce, Traveller advocate, Doctor of Sociology and recent appointee to the Council of State also sent her message: “Education is a basic human right and it can be very empowering. We must offer a safe space to validate identity and culture that is both inside the institution and outside the institution. Hughie Friel, Donegal Traveller Project has a son and daughter who have been to college. But he says college can be a lonely place for a Traveller. Traveller groups recently presented to the Oireachtas Joint Committee on Education and Skills and highlighted the need to create a more inclusive learning context that promotes respect for diversity, interculturalism and addresses racism. 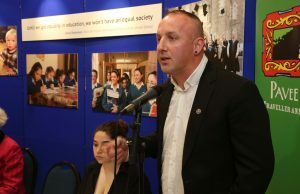 In closing the event, Pavee Point Co Director Martin Collins said direct and targeted measures are needed to promote Traveller and Roma inclusion in mainstream education. Quoting the first Hispanic Justice in the US Supreme Court, Sonia Sotomayor he said: “Until we get equality in education, we won’t have an equal society”. 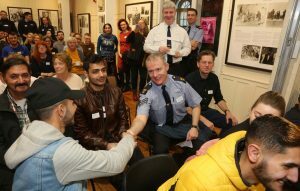 People shake hands to celebrate International Traveller & Roma Day. Reece Smyth, Chargé D’affaires at the US Embassy says that racism against Travellers is accepted in our society and that the majority population need education to challenge this. 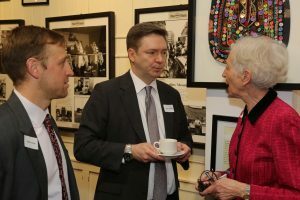 With Kevin Furey and Anastasia Crickley. 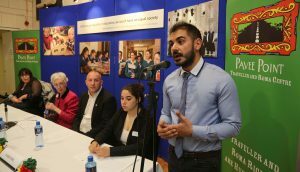 People travelled from all over the country for the International Roma Day event. The audience enjoying the stories of the day.